The Days are Getting Longer! 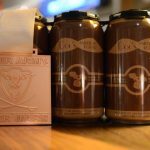 New beers, more hoppiness, re-releases and new digs. Enough philosophical stuff – we have exciting news! Of course, the new taproom in downtown Louisville is right up there, but at the moment we’re really excited about our newest release – our Cherry Saison. Many of you have had it, but now we are releasing it in 12 oz/6 packs and making a boatload of it. Look for it in stores just before Valentine’s Day (yes, the packaging is red – see below). While we haven’t totally finalized the deal, I can’t hold back. We have been able to find a source for Nelson Sauvin hops – the ones that are the primary hops for 13 IPA. 13 has been one of our most popular brands, but we’ve never been able to produce it in quantity. Looks like by April we will be able to and we couldn’t be happier. So look for it in stores, restaurants and tap houses this spring. Of course, Summertime will be coming back in April as well. We will also be releasing its cousin, Blood Orange Kolsch in April, but only in kegs – so look for it on tap in your favorite restaurant or tap house. If you can’t wait until April, look for it very soon at Murphy’s Tap House in Louisville and in our taproom. We are also bringing back an old favorite, Wuerzburger. Wuerzburger is part of our Original Series (recreating the original recipes of our namesake that was founded in 1875). It is in the Helles Bock style – a wonderful lager that is both light and strong (by early 1900’s standards – about 6.5% ABV). We will be using all Colorado malt and hops to brew this beer. We originally released it in bottles, but this new edition will be packaged in 12 oz cans/6 packs with a beautiful retro label designed by our Graphics Designer, Timm Bryson. Planned release is sometime in May or June. at t.horst@crystalspringsbrewing.com and I’ll give you more information and get you signed up. 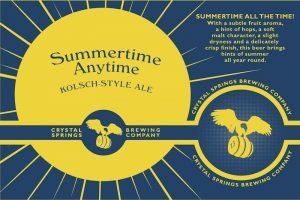 or k.horst@crystalspringsbrewing.com for more information. Stay well, be happy and don’t forget that beer and food were made for each other. I’m hopeful this finds you with a smile on your face and a great locally owned Colorado craft brewery made beer in your hand. Have a great year!